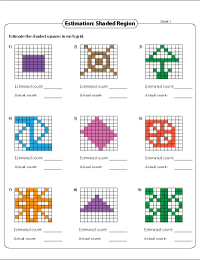 Estimate and Count Worksheets for beginners consist of colorful sets of practice sheets that are exciting for children to work with. Students are first asked to estimate and then count the objects. 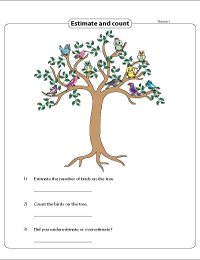 MCQs asked from themes are also included to understand the concept of estimation. 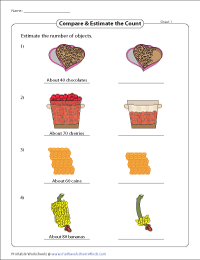 In each estimation worksheet, estimate the number of objects and compare it with the actual count. Also identify the type of estimate (underestimate / overestimate). 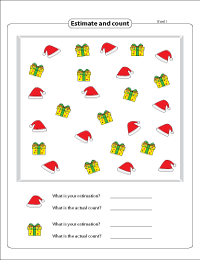 Worksheets have MCQs given in three different interesting themes. Estimate the number of objects in each case. Grids are given with colorful shaded areas. Estimate the number of shaded squares and compare it with the actual count. Objects with two different quantities are shown. 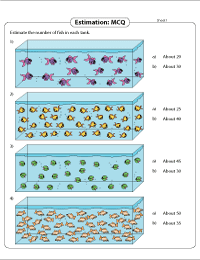 The estimate of one quantity is given and the other quantity is to be compared and estimated. 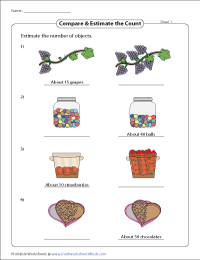 In these estimation worksheets compare and estimate the quantity of objects shown in the picture without actually counting them. Few objects are depicted in a group. Estimate the quantity and also check the accuracy of your estimate by counting the objects. 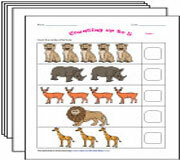 These worksheets help kids to practice counting in the most effective way. These include counting pictures, matching objects, real life word problems and more.